One of my favorite books growing up was Charlie and the Chocolate Factory. I loved everything Roald Dahl wrote (Matilda, The Twits and The BFG are also among my very favorites), but there's just something unique about this story. And, if I'm being honest, every time I come across blueberries, I just can't help but think of Violet Beauregarde and the famous line referenced in the title of this post -- "Violet, you're turning Violet, Violet!" So it's really no wonder that this happened when I started using The Body Shop Blueberry Shower Gel. I'm always a fan of shower gels by The Body Shop, and this one is no different. It smells just enough of blueberries to make me long for a hot summer day without feeling cloying or overpowering. The formulation includes Community Fair Trade honey from Ethiopia and blueberry fruit extract to moisturize and soften the skin. Plus, it lathers up magnificently! And so, I leave you with none other than the Oompa Loompa Song about Violet Beauregarde from Charlie and the Chocolate Factory (the original, not the remake with Johnny Depp). It seems fitting, doesn't it? 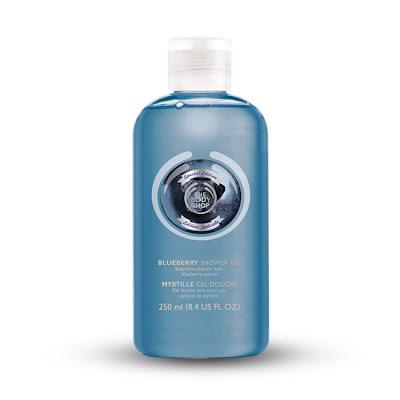 The Body Shop Blueberry Shower Gel retails for $8 at thebodyshop.com.